Posted on Mon, Mar 15, 2010 : 4:05 p.m. The University of Michigan will have to re-examine its holdings of Native American human remains under a change to federal guidelines announced today. The U-M Museum of Anthropology has about 1,400 human remains in a storage facility that are 800 to 3,000 years old. The 1990 Native American Graves Protection and Repatriation Act, known as NAGPRA, requires museums, federal agencies and institutions to inventory holdings of human remains and identify their cultural affiliations with tribes. Native groups can then claim the return of remains deemed to be culturally affiliated with them. 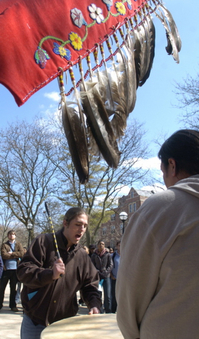 Frank Bartley III, an Odawa Indian and a U-M student, beats the drum and sings with other Native Americans in front of Fleming Hall in Ann Arbor before a U-M regents meeting in this 2008 file photo. The gathering was part of a request to the regents to return Native-American remains. What to do with the vast number of human remains where cultural identity hasn't been determined hadn't been fully addressed in the law and has been a sticking point between the University of Michigan and some Native American groups. U-M has designated the 1,380 human remains it stores "culturally unidentifiable." Under the rule change, U-M museum officials would need to alert modern-day federal tribes of any "culturally unidentifiable" human remains it has that were discovered near areas the tribes historically occupied. Those tribes could ask for the remains to be returned based on the geographic link. A national review committee would settle disputes between tribes. The change will take effect in May. John O'Shea, NAGPRA coordinator and curator of the U-M Museum of Anthropology, said the rule change would empty museums of Native American human remains and end future study of them. Some scientists, like O'Shea, say there are valid reasons for holding onto human remains, such as advances being made in the recovery and analysis of human DNA that could reveal more about the lives of America's native people. "The legal standard is much lower than scientists are accustomed to using," said Sherry Hutt, the program manager for National NAGPRA, a federal government program that assists the U.S. Secretary of the Interior with responsibilities related to the act. "The idea is these are human beings," Hutt said. "We are going to treat these human beings the same way we've treated the dominant culture." Hutt said that the change prompts consultation between institutions and Native American groups and reinforces what was already required in the law. A U-M panel was formed in October 2009 to examine ethical and scientific concerns surrounding the storage of the remains. The chairman of that committee was not immediately available for comment. U-M spokeswoman Kelly Cunningham said the university intends to comply fully with the change. "The regulations clearly establish a framework for disposition of culturally unidentified human remains," Cunningham said. "We will, of course, comply with the consultation and disposition requirements. The university will be setting up a process that will include discussions with American Indian communities about appropriate disposition." The storage of human remains has caused conflict between U-M and Native American groups. In November 2007, the Saginaw Chippewa Indian Tribe of Michigan wrote U-M President Mary Sue Coleman, requesting the return of the remains of 405 people excavated in the 1930s and 1960s from sites in Lapeer, Macomb and Saginaw counties. U-M responded that the remains at issue were culturally unaffiliated, and they could not, by law, return them. In 2008, the U-M graduate activist group the Native Caucus staged a demonstration at the annual Dance for Mother Earth Powwow at Crisler Arena by blocking off 1,380 seats in protest. The next year, student organizers moved the Powwow, a two-day event of traditional dance contests, exhibitions and other cultural elements, from Crisler Arena to Saline. Veronica Pasfield, a PhD candidate in the Program in American Culture and a Bay Mills Indian community tribal member, said the new regulations are a step in the right direction. "From where we stand today, it looks like the new regulations have finally resolved some of the acknowledged areas of confusion within NAGPRA," said Pasfield, who is also a co-chairwoman for the Native Caucus. "I hope that the university will take the regulations seriously and not look for loopholes." "It's great that these new regulations have come out," said Alys Alley, a U-M sophomore and co-chairwoman of the Native American Student Association. "I really hope to see U-M comply. I'd like to see my ancestors go back to their graves as soon as possible." Until then, the student-run Powwow, which is April 10-11, will remain off campus, organizers said. For the second year in a row, the event will be held at Saline Middle School. Organizers turned down U-M funding for the event. Thu, Mar 18, 2010 : 9:16 a.m. I am glad our ancestors are finally going to return their gift to the earth and complete their journeys. It is also good to see the voices of those who are willing to try to understand even if they are not native americans. Miigwetch! Gaye wii kaa g'gaa nenmaasiinanig gaa bi iayaajig. We will not forget the ones who were here before us. Wed, Mar 17, 2010 : 12:19 p.m. This issue was brought to my attention in January, when I was looking to write a story on the continued UM NASA powwow in Saline. I had a small awareness back in 2008, but didn't know what NAGPRA was. I did a great deal of research and I agree with the premise. I also agree it was to losely written and easy for Universities to find loopholes. What I am afraid of is this new law is still to broad and there are to many loopholes (much can be left up to "interpretation"). I continue to believe the writers of the original NAGPRA need to tighten up the language, leave no room for debate and even if the law is 1000 pages long make certain to close all loopholes. It has to not only include the repatriation of the human remains, but also current and future collections of funerary, ceremonial and patrimonial artifacts. I am hoping UM does comply with the new law and NASA returns their powwow to Crisler Arena as it was a rich tradition that as a contest powwow did much to help powwow families financially survive as all contest powwows do. Tue, Mar 16, 2010 : 10:33 a.m.
As an archaeologist, I am very happy with the federal government's ruling. It has been the position of the University and the Museum of Anthropology to wait for a final ruling on what to do, legally, with culturally unidentifiable remains. Now that the ruling has come, I expect there will be total compliance with the law as there always has been. It is a little concerning that the standard is so low for showing ownership, but I think most people recognize human remains and sacred objects are a special case. While some may complain that a geographic standard for cultural affiliation has numerous problems, I doubt there will ever be a "perfect" solution to making cultural identifications. I echo DennisP's hope that this ruling will end some of the hostility between researchers and native peoples, and will soon be recognized by all as a good thing. Tue, Mar 16, 2010 : 10:32 a.m.
sbbuilder, thank you for your posts. It seems clear that you are putting some thought into your perspective and that perspective should not be silenced. DavidP, thank you also for adding an intelligent reply. Although I agree in large part with what you say, and appreciate your optimism, I disagree with one of your primary claims. As a member of the scientific community, I do not believe that if universities request permission to study remains and agree to do so in a manner tribes find acceptable they will gain access for purposes of study. On the contrary, it seems that in all likelihood, this WILL harm science. I have seen nothing to suggest that tribes will willingly cooperate with scientists on any research that could either compromise their claims to property or cast their ancestors or their past practices in a negative light. It seems to me that letting individual tribes decide what research should be supported will heavily bias future scientific discoveries. That said, this might be one of those times when the scientific quest for knowledge should be trumped by our responsibility to respect the dignity of all people but I wont add my thoughts about that here. Tue, Mar 16, 2010 : 9:26 a.m. Thank you Dennis P. I am a Native American student attending the University of Michigan and have wondered for quite awhile now why the University and the tribes can't just work together. I would like to see what conclusions can be drawn from research, but I would also like human remains to be treated with the respect their descendants ask, regardless of what people they are from. Tue, Mar 16, 2010 : 8:21 a.m. Thanks DennisP for your excellent post! Tue, Mar 16, 2010 : 1:57 a.m.
Mon, Mar 15, 2010 : 10:55 p.m. Uh...hello? People indigenous to North America ARE in their country. We have a right to join a unanimous Congress in calling for the protections created under this law two decades ago--as well as protesting colonial and illegal practices of problematic museums. If I'm reading media coverage accurately, what I find most interesting about this story is UM faculty's continued references to future research desires as a reason to hold onto remains. If I correctly understand my interviews with leadership in the National NAGPRA Program, the law explicitly prohibits this. Yet another example of an ethically and legally problematic approach to this law?? For me, this is a much more interesting critique than comparing disparate peoples with unrelated spiritual and cultural beliefs and practices. It certainly cuts closer to the heart of the events detailed in this story. I'm grateful the U of M and A2 communities are finally digging in and really working to understand this law and the university's engagement with it! Miigwetch to those who are working hard with a good heart. UM's legacy of research excellence deserves it. Mon, Mar 15, 2010 : 10:31 p.m. Thank you, Dennis P. for your humane response to a very rude and insensitive post. Mon, Mar 15, 2010 : 9:30 p.m. I Thank You DennisP. And all of my native American relatives thank you for your comments. Mon, Mar 15, 2010 : 8:49 p.m.
DennisP The mummies are on display in their own countries for everybody to see. I'm not talking about those countries demanding the return of relics from foreign lands. Certainly there is room for much debate on that issue. The natives of those countries are not demanding that the mummies be put back in the earth, as are the Native Americans. Shucks, they even send the relics on world tours. I'd like to see the N.A Indians propose the same. Mon, Mar 15, 2010 : 8:32 p.m.
Actually, Egypt and the various countries in South and Central America are demanding both their human and artisan relics back. As well as many other countries throughout the world. Antiquities aren't no longer the playthings of wealthy collectors, museums and universities. That said, however, the only debate on this issue was had some time back when they passed the law. It's time to honor the intent of the law and return the remains. Will universities and colleges lose some easy opportunities for research? Maybe, but, it's also possible that if they worked with native tribes rather than stonewall them, tribespeople would welcome scientific inquiry done under terms and conditions respectful to their beliefs. In addition, it would offer an opportunity for native American scientists to participate and engage in any such study. Doing so would offer no guarantees, I'm sure. After all, it is understandable if tribespeople retain an instinctive suspicion of these institutions because of past treatment and disdain. I'm neither Native American nor a bleeding heart, but to me it is a simple matter of human dignity that goes beyond any one culture or race. Great credit to the Native Americans for fighting for the dignity of their ancestors of 3000 years back. This isn't a debate about science or no science. It's a debate about who should own and possess the remains and set the ground rules of dignity and respect for any research to be done. Whether one agrees with the outcome or not, Congress drew that line some time back and settled that debate. Congress found in favor of the best presumed descendants and against keeping remains in dusty bins and cabinets identified by some alphanumeric coding system. I don't think it will harm science at all. I just think that if universities request permission to study remains and agree to do so in a manner tribes find acceptable they will gain access for purposes of study. It's time the universities actually started exercising real respect rather than simply talking about it in a bunch of self-aggrandizing sermons on MLK day while hiding behind a legal ambiguity. And that holds true for all remains from all parts of the world--regardless of how old. Mon, Mar 15, 2010 : 7:01 p.m. I don't see the Egyptians clamoring for the re-internment of the hundreds of mummies of their ancestors. I don't see the Peruvians clamoring for the re-internment of their mummies either. I don't see the Kenyans clamoring for the re-internment of the fossils found at Olduvai gorge, but that may be because those are really, really old. With all respect for the dead, those remains that are hundreds, and even thousands of years old have an extremely low probablility of being in any way related to the Indian tribes currently from those areas. I'm a little rusty on my ancient Indian history, but apart from the far north Eskimo and a few others, the Indians of North America were either on the move, busy wiping out some other tribe, intermarrying, or abandoning an area altogether because of climate change. (Yep, gotta love those mini ice-ages.) How about some definitive DNA analysis? Mon, Mar 15, 2010 : 5:59 p.m.
remains that old have arguably no more connection to current native american populations ( given migrations, tribal wars etc) than they do to the archeologists who are their custodians... NAGPRA is noble in concept but often quite flawed in reasonable or practical execution, and problematic in terms of fostering the scholarship about the past of the very people whose identities are objectively ( as opposed to fancifully/mythically ) validated by such scholarship. Mon, Mar 15, 2010 : 5:44 p.m. Ridiculous. All this amounts to is a grab at sensationalist media exposure. Maybe they can leverage this "outrage" into another tax free casino. Mon, Mar 15, 2010 : 4:51 p.m. Finally. The end of this tragic saga is in sight.